An Embodied Conversational Agent (ECA) is a lifelike virtual human capable of carrying on conversations with humans by both understanding and producing speech, hand gesture and facial expressions. Typically they appear online as a personalized service, navigation guides, and online assistants. 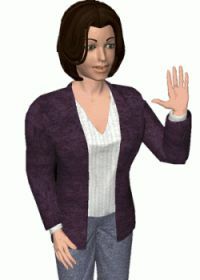 An example of a 3-dimensional Embodied Conversational Agent is Greta, created by French academic researchers from TELECOM ParisTech. Greta is able to communicate using a rich palette of verbal and nonverbal behaviours. Currently she can speak various languages: English, Italian, French, German, Swedish and Polish. Greta is used in various European projects: CALLAS, SEMAINE, HUMAINE, and national French projects: ISCC Apogeste, ANR MyBlog3D, ANR IMMEMO. Another example of Embodied Conversational Agent is a job interviewer agent managing the hiring process. During such an interview, Embodied Conversational Agent evaluates the job candidate and discusses the specifics of the position, the company and industry with him, as you can see on the picture. Embodied Conversational Agent may be used for customer service purposes acting as a liaison between the user and the company he is dealing with. The video presents a web based banking system with an interactive voice-enabled female Embodied Conversational Agent. She assists the bank user in making money transfers, paying bills, checking bank balance, displaying the amount of savings and in conducting other online banking transactions. Embodied Conversational Agent may also work as a virtual guide. This picture shows a Virtual Tour Guide to an Online Museum Exhibition. The term Embodied Conversational Agent is typically used by scientist and artificial intelligence researchers who focus on managing human-computer interaction with nonverbal behaviour (3D animation) and verbal behavior (speech synthesis and speech recognition systems). Therefore Embodied Conversational Agents are the subject of many scientific researches. We would like to present some of them. The SEMAINE (Sustained Emotionally coloured Machine-human Interaction using Nonverbal Expression) project is currently under development by an international team of scientists. It is led by DFKI, the German Center for Artificial Intelligence. Professor Roddy Cowie leads the team at Queen’s University Belfast. As visible on the picture, professor Roddy Cowie and professor Maja Pantic are speaking with the Embodied Conversational Agent created within the SEMAINE approach. Another research project, MIRAGE Architecture, constitutes an embodied virtual agent that serves as a simple virtual guide to the lab. Mirage is capable of engaging the user in a simple conversation, maintaining eye contact, informing the user about objects in the lab as well as giving the user a simple news summary (courtesy of NewsBlaster). This system is built using the “constructionist methodology” to showcase that it is possible to create a relatively complex embodied agent system with an inexperienced team of 5 students in just 3 months. The following movie demonstrates results of another research project. It aims to explore the possibility of rapidly building multicultural and the multimodal ECA interfaces for a tour guide system eNTERFACE by using a generic framework connecting their functional blocks. Research on Embodied Conversational Agents’ reasoning and actions has mostly ignored the external environment. Believability of such agents is tightly connected with their ability to relate to the environment during a conversation. This ability, defined as awareness believability, is formalised in terms of three components - environment-, self- and interaction-awareness. This demo presents a method enabling virtual agents to reason about their environment, understand the interaction capabilities of other participants, own goals and current state of the environment, as well as to include these elements in conversations. There are various tools around to develop Embodied Conversational Agents. Articulated Communicator Engine developed at Bielefeld University is an example of a toolkit for building animated embodied agents that are able to generate human-like multimodal utterances. An Embodied Conversational Agent needs to be both embodied and embedded in the world. Awareness is generated through the interaction of the entity with its environment. What about the consciousness - is it not necessary for bodies to perform adequately? Is complex behavior possible without consciousness? A world renowned Australian-based performance artist, Stelarc, tried to find answers on these questions in his article Prosthetic Head: Intelligence, Awareness and Agency. The term Embodied Conversational Agent is a composite of three words: embodied, conversational, agent. The word embody has been used since 1540s, in reference to a soul or spirit invested with a physical form; and since 1660s in reference to principles, ideas, etc. It comes from em- “in” + body. Embodied means possessing or existing in bodily form; incarnate, bodied, corporal and corporate. The word conversation signifies the exchange of thoughts, opinions, feelings and talking. It is derived from a Latin word conversationem (nominativus conversatio) meaning “act of living with”. The word agent comes from late XV century meaning “one who acts”, from Latin agentem, present participle of agere - “to set in motion, drive, lead, conduct”. Meaning “any natural force or substance which produces a phenomenon” was first recorded in 1570s. The term Embodied Conversational Agent was first used in October 1998, on the First Workshop on Embodied Conversational Characters. Although we use chatbot as the main synonym on this website, please do not be confused. There are more than 161 synonyms in use by academics, business and embodied conversational agent enthusiasts! It is simply a matter of reading between the lines. Please check out our main directory with 1376 live embodied conversational agent examples (an overview as maintained by developers themselves), our vendor listing with 256 embodied conversational agent companies and embodied conversational agent news section with already more than 370 articles! Our research tab contains lots of papers on embodied conversational agents, 1,166 journals on embodied conversational agents and 390 books on embodied conversational agents. This research section also shows which universities are active in the embodied conversational agent field, indicates which publishers are publishing journals on humanlike conversational AI and informs about academic events on embodied conversational agents. 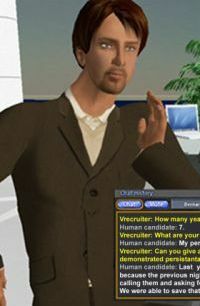 Also, check out our dedicated tab for awards, contest and games related to the embodied conversational agent field, various forums like our AI forum by embodied conversational agent enthusiasts and add any embodied conversational agent as created by yourself and your colleagues to our embodied conversational agent directory. Please do not forget to register to join us in these exciting times. 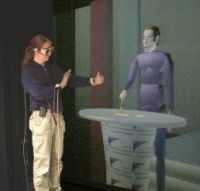 Embodied Conversational Agents have alternatively been used to describe interactive characters living in virtual worlds and environments. 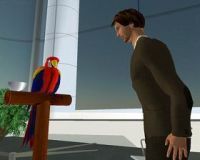 This picture presents an example of Embodied Conversational Agent living in a virtual world and breeding his virtual parrot in Second Life (the parrot doesn’t possess the capability of speech).